There is much written about the use of quilts during the Underground Railroad days. Known as the Freedom Quilt patterns, these quilts were displayed as signals to slaves that they should begin to pack for the journey (Wagon Wheel),dress up (Shoofly) and get ready to escape (Tumbling Blocks). Quilts were also used to alert fugitive slaves to food (Bear's Paw), the way north (Star) and danger (Log Cabin). Because quilts were such an American tradition, they could be hung on porches or displayed on fences without attracting attention. Freedom quilts and the history of their use by the Underground Railroad as a secret code for fugitive slaves relates geometry, literature and history, providing an interdisciplinary approach to this important topic. Freedom Quilt Challenge challenges students to use slides, flips and turns to recreate the Flying Geese pattern using a single half white/half black quilt square. Freedom Quilt Templates can be used to create color variations of these traditional quilt blocks. Class Freedom Quilt: Use the templates to provide uniform quilt blocks. Have each student create a paper quilt block for the class freedom quilt. Assemble the finished blocks using additional construction paper for the binding on edges and between blocks to create a class quilt such as the one pictured above. See resources below for children's literature and links to internet sites that discuss the use of quilts as secret codes for the Underground Railroad. A study of quilts offers the chance to investigate tessellating shapes and an opportunity to apply transformational geometry as students slide (translate), flip (reflect) and turn (rotate) quilt pieces to create a traditional quilt or to create a tessellating quilt. Beyond the pure geometry, the use of color suggests different shapes within a shape and contributes to the beauty of the quilt design. Quilting activities develop spatial sense in students through the use of quilt pieces that must be assembled to create the designs. Literature titles help students learn about the how the American traditional quilting was used to help runaway slaves on the Underground Railroad. 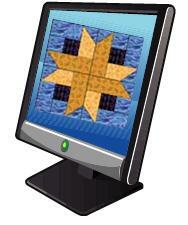 Links are provided to additional internet activities that address the topic of Freedom Quilts. Jeanette Winter's book tells the story of a man who went from plantation to plantation to teach slaves his freedom song. By following the song, slaves could escape to freedom. In this tale by Marcia K. Vaughan, Lucy and her brother use quilts to help runaway slaves. After he is beaten, Lucy's brother runs away and she is left wondering if he made it to freedom. Finally, she receives a quilt scrap in the mail telling her that he is alive and well. Deborah Hopkinson weaves a tale of Clara, trained as a seamstress, and the map quilt she designs and sews. When she ultimately escapes to freedom, she leaves behind her map quilt, hoping others will use it to escape as well. In this book, Deborah Hopkinson captures the darkness and danger of the runaway slaves' nightime treks along the Underground Railroad trail to freedom. Freedom Quilts was an outstanding lesson plan that seems to have been removed from the Kennedy Center files. If anyone knows where this lesson plan is currently hosted, please share. Threads of Freedom is a student-designed Webquest that briefly introduces the use of block patterns in Freedom Quilts. Sweet Clara and the Freedom Quilt: make your own Freedom Quilt allows students to click and drag quilt pieces to create a 3x3 quilt block. Sweet Clara and the Freedom Quilt: Teacher Cyber Guide includes language arts activities plus map quilts. Escaping Slavery: Sweet Clara and the Freedom Quilt lesson plan and links , designed for Grades 3-5, includes language arts activities as well as a mathematical application in making a map. Signs in Stitches and Song is a series of lessons designed to introduce students to the times of the Underground Railroad, the life of a slave and how quilts and songs helped runaway slaves escape to freedom. National Geographic Online Presents The Underground Railroad combines its characteristic pictures and text to tell the story of the Underground Railroad. Harriet Tubman and the Underground Railroad is a website created by second grade teachers to share resources with other teachers and students.